We spent today with our extended family. This happens every two years with this branch of the family, and as usual, it was a good time. Lots of food, conversation, and river play along the Current River. The kids pretty much spent the day in the river, as usual. The grownups kept an eye on the kids and visited with each other. We caught up on what cousins were up to, met new additions to the family, and generally had an enjoyable day. I expected a quiet town on a Sunday. I envisioned a fast group photo with Superman before getting back on the road. Little did we know that we would also meet Batman, Iron Man, Super Girl, the Joker, and many more super heroes! 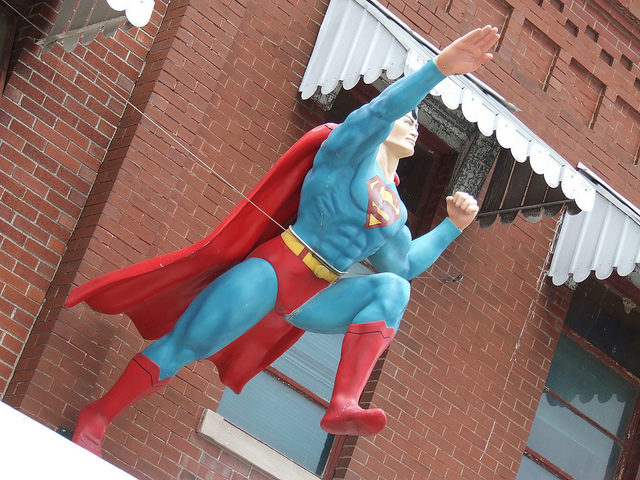 We had no idea that this was the weekend of the Superman Convention in Metropolis Illinois. Wow! We had unknowingly walked into an outdoor carnival, complete with contests for superheroes, villains and monsters. We wandered the town for an hour thoroughly enjoying ourselves. As the kids exclaimed, “It’s like Wizard World (a Chicago area comic book convention we go to every year), for Superman!” And yes, indeed, it was. We all agreed that Mr. Freeze was the best costume. If you're are out there Mr. Freeze, we voted for you! It made for a fun side trip on a generally unexciting part of our vacation. A fun whirlwind adventure. Four states: Illinois, Missouri, Arkansas, Kentucky. One more state to mark off our map as visited and explored. One more experience to mark off our list of things to try! One more adventure to add to our memories.